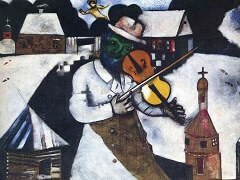 Marc Chagall was born Moishe/Marc Shagal in Liozne, near Vitebsk, in modern day Belarus, in 1887. He was a Russian-French-Jewish artist of international repute who, arguably, was one of the most influential modernist artists of the 20th Century, both as an early modernist, and as an important part of the Jewish artistic tradition. He distinguished himself in many arenas: as a painter, book illustrator, ceramicist, stained-glass painter, stage set designer and tapestry maker. Widely admired by both his contemporaries, and by later artists, he forged his creative path in spite of the many difficulties and injustices he faced in his long lifetime. Chagall's early life in the schetl with his Hasidic Jew parents was a strong influence on his work throughout his life. He carried a Russian mysticism, and an intrinsic understanding of and sympathy for his religious roots wherever he travelled. Though open to new ideas, and embracing many elements of the modernist style, of which he was an early proponent, the dreams and realities of his early life ever formed the core of his aesthetics. Early works show that he had a happy childhood, in spite of the hard life he and his family faced. It is important to note that, unlike some other Jews of his generation, he never tried to hide his connection to Judaism. Much of his work contains the internal dichotomy between traditional Jewish art, and modernist art. 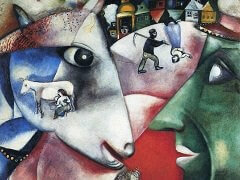 In 1906, Chagall moved to St. Petersburg, the centre of the Russian artistic world. He studied under Léon Bakst at the Zvantseva School of Drawing and Painting from 1908-1910. Whilst there, he was introduced to the works of Paul Gauguin. During this period, he returned home frequently, and met his future wife, and subject of many of his paintings, Bella Rosenfeld. Paris was at that time the centre of the modern art world. In 1910, Chagall moved there, drawn to this centre of creative endeavour. His timing could not have been bettered. Paris then was abuzz with the new art of Cubism, and exhibitions of the work of Cezanne, Van Gogh and early Matisse. Cubism was the dominant movement at the time, though much of the French art establishment was still under the sway of older 19th Century ideas. Chagall was like a breath of fresh air, with his ideas of art as coming from inside, being an outwards projection of one's mind and psychic being. In Paris, Chagall slowly integrated into the art society of the time, and met a lot of influential Parisian bohemians. He became interested in, and incorporated into his painting, elements of cubism, and also new trends of, of example, futurism and orphism. It was during this time that Chagall had his first commercial successes. He became an integral part of what later became known as the Ecole de Paris. Some of his paintings from this period, like Paris Through the Window, show his very successful attempts to fit into his new milieu, while others, like The Birthday, and I and the Village are filled with nostalgia for his old life in Vitebsk. The range of emotive and whimsical figures and motifs in Chagall's work led André Breton to say that he alone had returned metaphor triumphantly to modern painting. Some of the otherworldly, supernatural touches in his paintings were said to prefigure surrealism. After a number of large and successful exhibitions, Chagall went back to Russia to visit his family, and then fiancée, Bella. Unfortunately, he was forced to stay indefinitely in Russia after the outbreak of the First World War prevented his return to France. Chagall's work during this period was dominated, of course, by his thoughts of the war, and death, as seen in 'War', though also by a nostalgia for his everyday life in Vitebsk, The Fiddler and his love for Bella, in such works as La Mariée and The Promenade. His witnessing of a worsening of persecution of the Jews during the war also led him to create a number of deeply religious paintings. 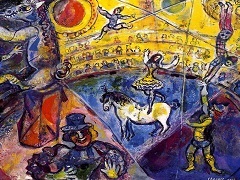 In Russia, Chagall did fairly well in terms of his reputation, gaining a degree of international caché, but only scraped by financially, exhibiting his work, illustrating books, and designing murals and stage sets. Eventually, in 1923, Chagall returned to Paris, with his wife, Bella. 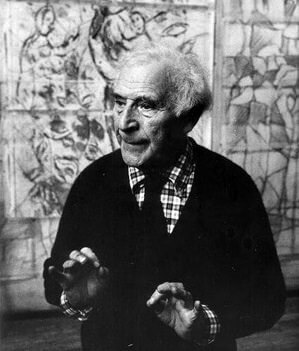 Chagall travelled all over the world as his reputation of a painter and illustrator of high repute grew. He created etchings for works including The Bible, Gogol's 'Dead Souls' and 'La Fontaine's Fables', later recognised as his finest illustrations. He travelled throughout Europe, to Palestine and the Middle East, solidifying his personal view of himself as the archetypal Solitude. The terrible events of the Second World War put Chagall in danger. In 1937, Nazi officials purged German museums of works the Party considered to be degenerate. In March of 1939 over one thousand paintings and almost four thousand watercolors and drawings of modern artists, including Marc Chagall, Wassily Kandinsky, Paul Klee, Piet Mondrian, and Franz Marc, were burned in the courtyard of a fire station in Berlin. As a high-profile Jew he was put on a list of artists whose lives were at risk from the Nazis, and, fortunately, in 1941 he escaped to America. 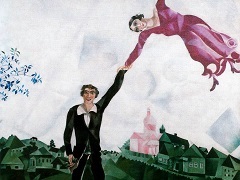 Chagall and Bella arrived in New York the day after Germany invaded the Soviet Union. In New York, Chagall was a fish out of water, but still managed to forge an artistic life here, where he did not yet speak the language. He forged friendships with Mondrian and Breton, and, represented by the son of Henri Matisse, held successful exhibitions. He also designed large, dramatic and beautiful sets for the ballet, 'Aleko'. But the war was an extremely dark period for Chagall. He was deeply and profoundly distraught by the decimation of his home town Vitebsk, and the news of the concentration camps. The death of Bella in 1944 compounded his grief. The United States were never home to him, and in 1947 he returned to France. He continued to paint, and also had huge success with stained glass windows, first completing a commission for Hadassah University Medical Center in Jerusalem, later commissions from around the world. His masterful use of colour and symbolism were strongly praised. Picasso once stated that when Matisse died, Chagall would be the only one who really understood what colour was, adding that his canvasses were really painted, not just tossed together. Chagall's works are steeped in his Jewish heritage, often including memories of his home in Vitebsk, Belarus and it's folk culture. 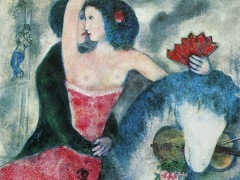 These subjects are the themes that Chagall always returns to. Some have argued that his painting style after the war was more subdued, melancholy, even hearkening back in time to post-Impressionism, but as ever, his work was entirely, uniquely his own. Chagall, throughout his career, incorporated elements from many schools of modern art, including Cubism, Fauvism, Symbolism, Surrealism, Orphism and Futurism. Ever though, his work revealed deeper levels of a resonant, lyrical emotional aesthetic, of music and culture, of a deep, intrinsic understanding of Jewish heritage. In 1985, Chagall died and was buried in France. At the time of his death, he left a number of his extensive collection in various branches and styles of the arts. 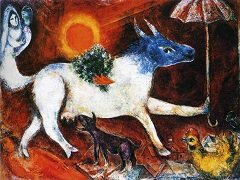 Chagall's work shows a masterful understanding of colour, and a deep emotional resonance, which is perhaps why his work is still so popular today. His contribution to 20th Century art world is one only very few artists can claim to have made.